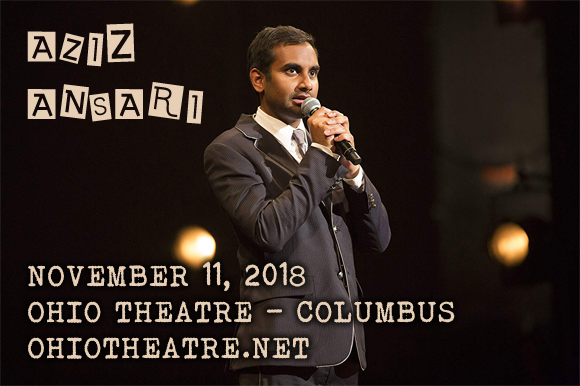 Enjoy brand new comedy from Master of None star Aziz Ansari, coming to Ohio Theatre – Columbus on Sunday 11th November 2018 on his Working Out New Material Tour! Having recently made his comedy comeback at the Comedy Cellar in New York City, Ansari will be touring across North America this fall, bringing his hilarious and astute laugh-a-minute humor to te stage once more! Don't delay – tickets will sell fast! American actor, writer, producer, director, and comedian Aziz Ansari began his career in New York as part of the Upright Citizen's Brigade Theatre and on the local comedy circuit. In 2007, MTV greenlit a sketch series called Human Giant, which Ansari created and starred in, running for two seasons. This led to him being cast as Tom Haverford in the NBC series Parks and Recreation (2009 – 2015), his best known role alongside his starring role in the Netflix series Master of None (2015 -), which he also created. Ansari won several awards for both his writing and acting for Master of None, including two Emmys and a Golden Globe for Best Actor – Television Series Musical or Comedy, making him the first Indian American and Asian American actor to win a Golden Globe for acting in television. Ansari released his debut stand-up comedy special, Intimate Moments for a Sensual Evening, in 2010. He has released four stand-up comedy specials to date, including Live at Madison Square Garden, which was released on Netflix in 2015. He has alao had acting roles in several box office films, including Funny People; I Love You, Man; Observe and Report; and 30 Minutes or Less.